Just under 3 years ago, this was a Grand Final match up. This is probably the closest these two sides have been to each other since. Who will win this week? Our chances will probably depend on the fitness of a couple of important players, but we're playing well enough to win. Flag No.10 wrote: Our chances will probably depend on the fitness of a couple of important players, but we're playing well enough to win. Forgotten Eagles midfielder Jake Comitogianni could play his first Macca’s League game of the season against West on Saturday. The ball magnet has been named on a four-man extended interchange bench with fellow inclusion Jack Firns, who has recovered from a shoulder injury. The pair are in contention to replace Angus Poole, who will miss one match after accepting an early guilty plea for laying a rough tackle against the Crows in Round 10. McLeod, Cook, Hawkins, Sibley, Minney, Weidemann, Schmusch, X.Redden, Martin, C.Gaffney, E.Miller, J.Miller, Moore, Wehr, Mead, McKay, Heinjus, Wood, Bruce, Borholm, J.Gaffney. West Adelaide has regained a goalsneak in timely fashion for the clash with the Eagles on Saturday. Former Geelong rookie Zac Bates have overcome a minor hip injury to be named on a five-man interchange bench. His presence could be crucial given the Bloods will be without livewire Izak Rankine, who will play for the McDonald’s SA U18 team on Sunday. Murray Waite and Dustin Head have also joined Bates in the 23-man squad after spending last round in the Reserves. Hupfeld, Pillion, Peter, McPherson, L. Ryan, Kirk, Heitmann, L. Evans, I. Johnson, Dunkin, Majok, Holliday, O. Johnson, G. Turner, Noonan, Osborn, Halkias, Miller, Fairlie, Lynch, Gutsche. Caruso, Dalgleish, Haysman, Gutsche, Gilbert, Horstmann, Earl, Hannagan, Milde, Heitmann, Morelli, Boylan, Neumann, Nunan, Westley, Hocking, Chamberlain, Tuckwell, Kent, Kennedy, Tierney, Wulff. As an Eagles supporter I am worried about his game. I watched the digital replay of westies and they are a good side. I will take a win of any size. People are writing off The bloods,but i am tipping us to still make the five. Bundy wrote: People are writing off The bloods,but i am tipping us to still make the five. I havent heard that ? I expect Eagles to win but West will be competitive. For mine this is the hardest to pick for the round. Eagles favourite yes, but Bloods have been competitive against good teams, keep that up and it is only a matter of time they get rewarded. Yes I agree . I think a few games are to pick this round. Im certain South and Centrals will win. At least we shouldn't have any reverse decisions in front of goal this week. Thiele wrote: At least we shouldn't have any reverse decisions in front of goal this week. Woodville Oval would have to be close to the worst in the SANFL . That centre square get boggy very quickly. Weather conditions not great today my umbrella committed suicide in the wind and rain coming horizontal. 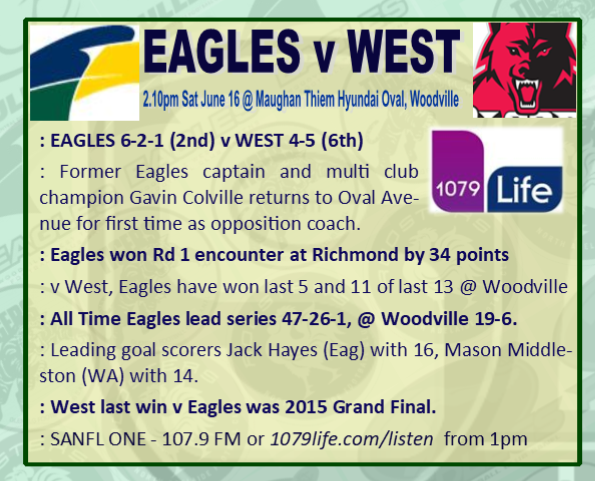 Fourth term Eagles locked the ball in their forward line. Seaside1 wrote: Woodville Oval would have to be close to the worst in the SANFL . That centre square get boggy very quickly. Cricket pitch is a worry, After the rains of the last few days I am not suprised. To me it looked better than I thought considering a game played on it earlier. I suppose Prospect may have the same issues. Not sure if any other clubs have cricket piches. Was good to hear the older Eagles players being like generals . I can't write the words that Boyd used but they worked . And Stewart using different words was just as effective . From where I sat in the cricket club I did not see the centre being much of an issue. Seaside must be stirring a bit. I was trying to watch the replay to get a camera perspective but yesterdays games are missing on digital. I forgot about Glenelg and did not realise Unley had a pitch. West dont have the cricket pitch I know every night they have training or junior matches . What I was trying to say perhaps West training on their home ground longer on an oval without cricket while it's great might not work in their favour in Winter on grounds with pitches .